The notorious theft, on Christmas Day in 1985, of more than 140 ancient objects from the National Museum of Anthropology in Mexico City, has become something of a legend in that country. The robbery was the work of two suburban, middle-class young men who were too inexperienced to fence the objects successfully. Their bungled efforts to cash in on the cultural loot in Acapulco, after a madcap drive through a range of Mexican landscapes, make for a comedy of errors. And, as it turns out, a hilarious heist film, now screening at the Toronto International Film Festival and opening in theatres in New York this week. 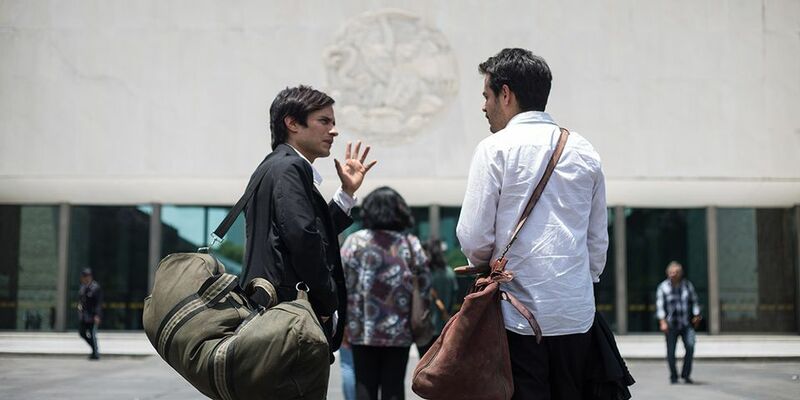 In Museo (Museum), by the Mexican director Alonso Ruizpalacios, the actor Gael García Bernal plays Juan, a ne’er-do-well son of a doctor who is as hopeless a failure as an antiquities thief as he is a veterinary student. And his family reminds him of his shortcomings at every turn. To prove them wrong, he cooks up a plan to steal a cache of small but valuable works after an earthquake leaves the country’s main archaeology museum vulnerable. Most of the laughs in the film come from incompetence on both sides of the law. Investigators conclude from the quality of the objects stolen that the thieves were professionals. Street cops searching Juan’s car for drugs find the loot but view the works as mere handicrafts. When Juan’s father hears of the robbery, he declares across the table from his son that the thief should be beaten and dragged in the streets until he bleeds to death. But this is also a comedy with a conscience. While spoofing suburban family life and lost youth, Museo has a moral tone built on Mexico’s stewardship of its ancient cultures. Inside that perspective is the critical view that Mexico’s leaders deprived its regions of their most valuable archaeological objects by carting them off to the capital to fill a Modernist monument to culture. Museo does not strive for absolute accuracy in revisiting the 1985 theft, however. Speaking at the Berlin International Film Festival earlier this year, where the film premiered and won the Silver Bear for best screenplay, Ruizpalacios said that he and his team approached the original thieves. They urged him not to make the film and refused to help with facts and details, so the screenwriters Ruizpalacios and Manuel Alcala filled in the historical gaps with fiction. As the film opens, text on the screen says the story is a “replica” of actual events. “Why ruin a good story by telling the truth?” the director said in Berlin. Yet ruin may not be the right word. The actual facts of the case, which include a desperate effort to barter the objects for cocaine after two years, make for an equally compelling story. Unlike the thieves, the Museum of Anthropology cooperated with the producers and production designer—a rarity for a heist film, given that most museums are wary of showing how they can be robbed, even decades after the fact. A number of scenes were filmed in the museum’s outdoor courtyards and gardens, while the rooms that the thieves target are realistic reconstructions of the permanent galleries and the objects are convincing replicas from the museum’s collection. It's a relief that they are props, especially when you see Juan take a toothbrush to clean the seventh-century Mayan jade mosaic funerary mask of K’inich Janaab’ Pakal from Palenque. “There are two types of films, those born from torment, and those born from happiness,” Ruizpalacios noted in Berlin. Museo clearly falls into second category, and even stumbles its way to a happy ending. In fact and in fiction, the objects stolen in 1985 were retrieved and returned to the museum.